← Day 15. Developing your promotional plan. Day 16. Should you be blogging? 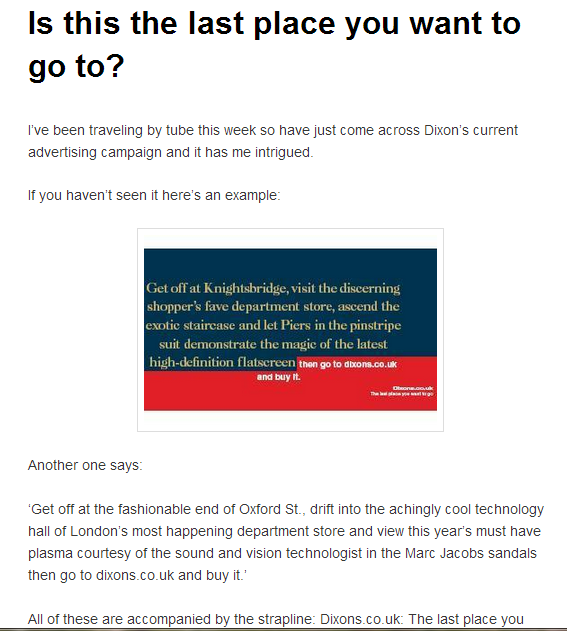 This blog about a controversial advertising campaign was one of my most successful. Did you start to think about how you are going to market your money making venture yesterday? Did you consider blogging? Today we’re going to think whether a blog would be useful to you. If you need to be online but don’t have the budget for a purpose designed website then a blog might be the answer. You can run a website and blog for very little or even no money. A blog is particularly useful if you need to demonstrate your expertise and reach out to a global market. A blog will allow you to build a following and track where your visitors are coming from and what they are reading. You can promote engagement with your prospects by encouraging comments and polls as well as integrating your posts with other social media channels. To be most effective you will need to post articles on a regular basis and keep on subject. develop your voice, let your personality shine through. People buy people, not everyone will like you but that’s OK. If you’re too bland you’ll win few readers. Don’t be afraid to be controversial or to write about controversial subjects. I always get more engagement on my blog when I write about a topic where people have strong opinions. promote your blog on your business card, email signature etc. In most polls WordPress emerges as the clear winner of the most popular blog host contest but some swear by Blogger, others like Posterous and Tumblr is growing in popularity particularly for blogs with high visual content. My personal favourite is WordPress which is easy to use, integrates well with You Tube for uploading video and gives great insights into where visitors are coming from and what they are reading. If you haven’t set up a blog before this video might help to get you going on WordPress. ACTION: Think whether a blog would be useful as part of your promotional strategy and if the answer is yes, set up your blog. Write your first article and share it in the comments here and in our Facebook group. We’ll share the links and promote your blog on Twitter too. Join us tomorrow to when we’ll be working out how to use social media to promote sales. Owner at the Training Pack and author of Founded after 40: How to start a business when you haven't got time to waste. Posted on December 6, 2013, in Marketing, Money Making and tagged Blog, Facebook, Posterous, Promote Your Blog, Social media, Tumblr, Twitter, Wordpress. Bookmark the permalink. Leave a comment.